The hugely popular, and long anticipated Great British Bake Off is now back on BBC2. For the next 9 weeks 8pm on Tuesday evenings will become sacred for many. We don’t just love the show, we also love seeing the products they use – many of which we stock. Here we will look at a few of them, and how they can help you be a Great British Baker. 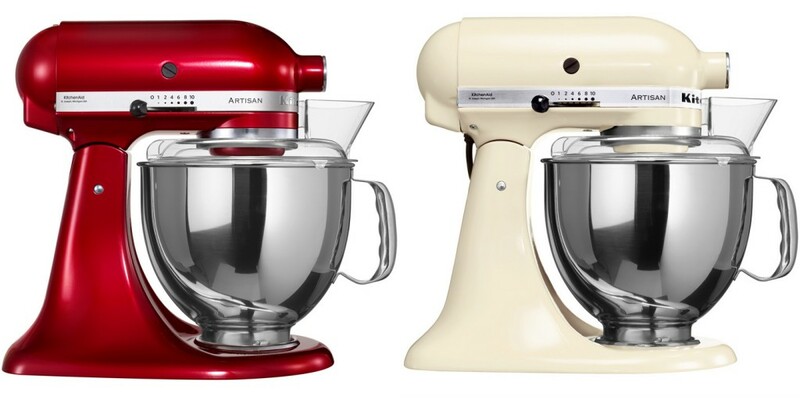 First up the instantly recognisable KitchenAid stand mixers. Pictured here in Candy Apple and Cream, these are the crème de la crème of mixers currently on the market. They come with 3 attachments – a whisk, dough hook and a flat beater, and there are a range of other attachments which you can purchase separately. If you’d like to know more about the KitchenAid stand mixer, why not check out some of our previous blogs. Any budding baker will need a range of utensils, from mixing bowls, to cake tins, to measuring spoons and decorating aids to name just a few. Buying the best you can afford will give you great baking results, and will stand the test of time – and use! We sell great quality products that you can invest in as you can see from the products above and below. All these and more are available from our baking department. baking, cake decorating, cake making, cake pans, cookie cutters, cooking, Great British Bake Off, Kitchen Craft, KitchenAid. Bookmark.